Approximately 75 percent of Peru’s coffee is produced above 1,200 meters, in the dry, temperate climate of the mountains and highlands. Peru is home to roughly 150,000 producers, who produce an average of 4 million bags per year — nearly all of it washed Arabica. Volcafe Way Peru launched in 2014 and today includes more than 2,500 farmers from across the country’s four main coffee regions: Cajamarca, San Martin, Junin and Pasco. Peru is well known for producing traditionally cultivated, shade-grown Arabica that is processed in artisanal wet-mill operations. Only fully ripe cherries are harvested manually and milled with a hand pulper. Coffee is then fermented in small tanks and dried on patios. 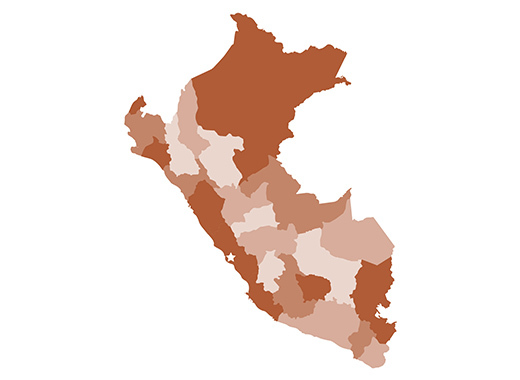 Peru is the eighth-largest producer in the world and one of the leading growers of certified coffees. Volcafe offers all major certifications, such as UTZ, Rainforest Alliance, organic and Fairtrade. Today approximately 125 employees work across our head office, in the field, in six warehouses and two processing plants, which are all fully equipped with laboratories for coffee analysis. Northwest of the province of Jaén, Chontali is surrounded by a chain of forested mountains that ring the Chunchucas River Valley. Our Café Chonta takes its name from a spiny palm that grows prolifically here. Smallholders cultivate an average of 2 to 3 hectares of land, at elevations up to 1,900 meters, producing coffees with good body, strong acidity, citric flavor and a characteristic lemon aroma. With a wooded mountain range on one side and a national park on the other, Santo Domingo boasts an ideal microclimate for coffee production. Smallholders tend to coffee plants at altitudes from 1,300 to 2,000 meters, resulting in coffees with medium to full body, high acidity, citric flavor and floral aromas. Our Café Minca refers to the tradition of minca in the Qechua language, referring to a legacy of fellowship among the farmers in the Junin region. This helpful camaraderie still exists and is used to multiply labor on each farmer’s land. Coffees from Junin grow at altitudes of 1,200 to 1,600 meters and are characterized by a heavy body, smooth acidity, sweet aroma and chocolate flavors.